Despite the market being awash with phonics texts, we decided to make My English Book and Me 3. How is My English Book and Me 3 different? 1. More than 1 anchor word per letter. My English Book and Me 3 introduces 4 anchor words per letter. 2. MANY MORE words for each letter. Numerous mini tests challenge children to write the letter beneath different words. Students enjoy the challenge whilst developing excellent phonetic and vocabulary skills. 3. Constant review and re – enforcement. Students come to us once a week. Everything they do must be meaningful and challenging. If not, students stagnate. My English Book and Me 3, reviews and re-enforces CONSTANTLY with mini – tests. 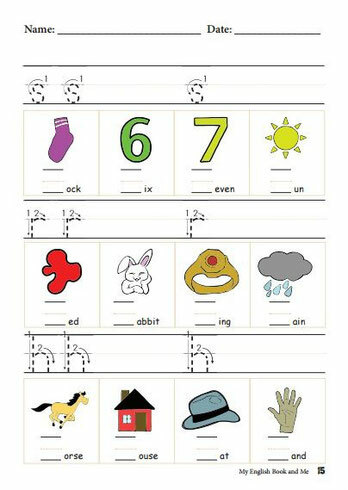 Students WILL learn their phonics thoroughly. These mini – tests can be RE – DONE up to 3 times if students don’t do well the first time. Students learn by correcting their mistakes and re-doing the following week (an idea borrowed from Daniel Boyle’s best-selling book: The Talent Code). In contrast, other texts DON’T review or the review is SO EASY as to be meaningless. With My English Book and Me 3, the FULL word is under the picture. Not only does this encourage students to READ but it clears up any confusion as to what the picture is. Learning a foreign language is hard. Requiring students to learn character names is a waste of valuable time. Perhaps you know the genre: Hi, I’m Lenny Leech. I’m Tommy Tapeworm. In the My English Book and Me series, there are NO characters. The students ARE the MAIN FOCUS—-the ‘character’ if there needs to be one. All vocabulary, questions and topics relate to them. 6. Beginning / Middle / Last letter and Extra Vowel Practice. Most textbooks require the student to write only the beginning letter. In My English Book and Me 3, students must fill in beginning, middle and last letters. They are teaching themselves to read as they sound out the words and write in the missing letters. We pay special attention to vowels. 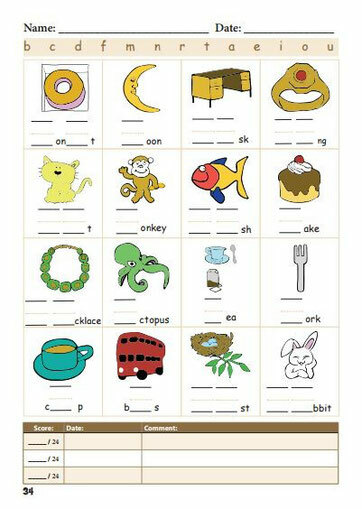 Many of the mini tests are 3 letter words with the vowel missing. These pages ALWAYS have many mistakes. If you have any questions / would like to see how the texts work in our classrooms, please contact us.